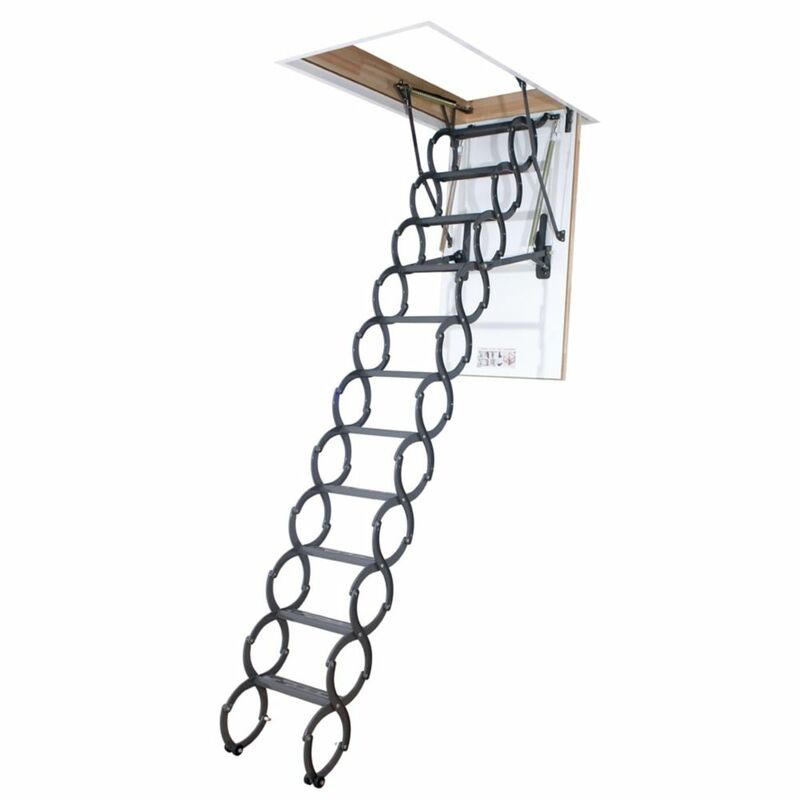 LST 9 ft. 6-inch, 25-inch x 47-inch Insulated Steel Scissor Attic Ladder with 300 lb. Capacity Fakro LST Scissor Attic Ladder is made from powder-coated quality steel and hand selected pine. Fully assembled unit is nicely finished with attention to detail and is ready to install. Well balanced scissor system ensures safe and easy operation and delivers 350 lbs. load capacity. The ladder unfolds and folds with minimum force and no sudden movements. Standard ladder length can be adjusted by adding or removing step segments, where each step is adding 8-inch to a ceiling height (step model # LSS 31, max. two steps). Offering a unique, modern appearance in a simple design, the S-shaped steps also conveniently serve as handrails while climbing. LST 9 ft. 6-inch, 25-inch x 47-inch Insulated Steel Scissor Attic Ladder with 300 lb. Capacity is rated 4.5 out of 5 by 4. Rated 5 out of 5 by Anonymous from The ladder was fine. I had to return it because it arrived with a a cracked edge. The ladder was fine. I had to return it because it arrived with a a cracked edge. Rated 5 out of 5 by TKarlinsey from Fantastic product!... Fantastic product! Rated 3 out of 5 by CactusJack from Interesting Interesting Design but the steps are too narrow to use. Rated 5 out of 5 by Keith from A Pricey, But Superior Attic Ladder If you're used to the wooden or aluminum fold-up attic ladders, you are in for a treat with a scissors ladder. First, it's made of steel so it is extremely sturdy and supports up to 300 lbs. Second, the scissors design means it self-adjusts to any height - no cutting the ladder for celing height. It's also insulated for energy efficiency. In the event you have an extremely high ceiling, you can buy additional stairs and just bolt them on. If all you want is a basic way to get to your attic, go with wood or aluminum. If you want a safer ladder with more capacity, check this out.